The past few months we’ve been following the progress of baby Luna. 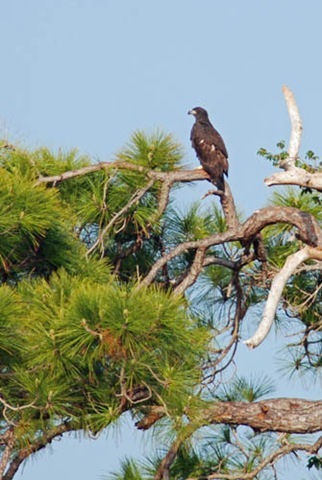 Luna was the first eaglet hatched on the island of Tierra Verde since they started keeping records. She was born during the Full moon of January and hence was named Luna. On any given morning I would find several photographers lined up along the edge of the pond, watching Luna peek over the edge of the nest waiting for her daddy to bring breakfast. Soon she ventured onto the edge of the nest and finally was brave and strong enough to fly from the nest to the branches. One Sunday morning she fell from the nest to a lower branch. She hung there for 23 or so hours until her daddy coaxed her back into the nest by flying overhead with food. Luna was a rock star among photographers and bird watchers near and far. Sadly, on April 18th she died. One of her faithful saw her fly over the highway and land on a pole. A few seconds later she appeared to loose her balance and fell to the roadway below. 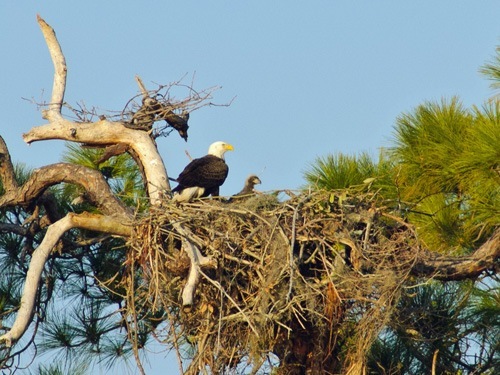 She was the second eaglet born in Pinellas County this season to die. It’s a hard life for these young fledgling eaglets, trying to test their strength without over doing it. She is fondly remembered. So many of us felt as though she was our own, instead of a wild bird of prey. 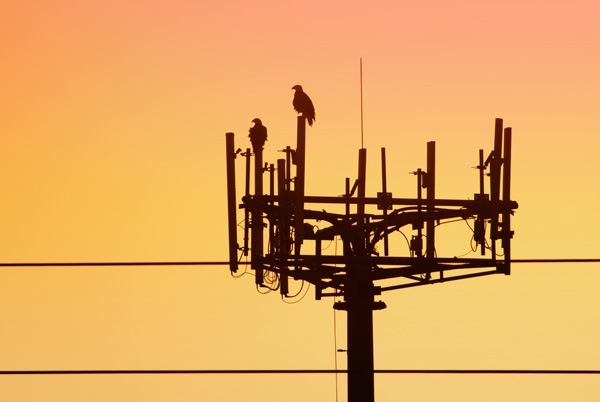 The evening she died I found her parents sitting together on the nearby Cell Tower looking south towards the nest. They would sit here daily and keep an eye on her as she learned to fend for herself. If it’s any consolation, the adults were first time parents. I’m sure nature has its way of educating. 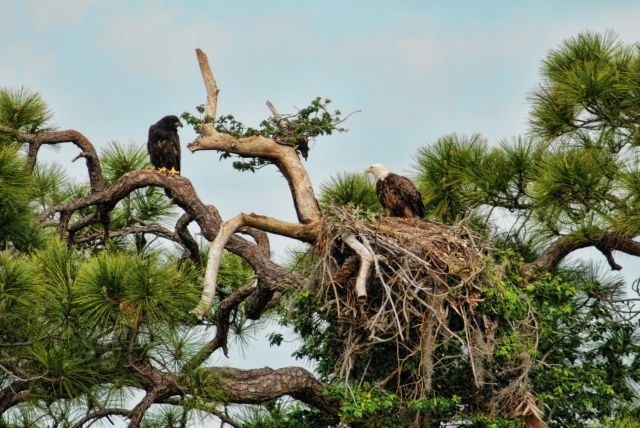 Maybe next year they will try again and this time, the eaglet whoever he or she may be, will survive and thrive. I know we’ll all be back next Fall, looking for the couple, watching them repair the nest and waiting for the signs a new baby is on the way. I was looking for blog posts about Tierra Verde to share on our site and I came across your post…If you’re open to it, shoot me an email at jane(at)dwellable(dot)com. 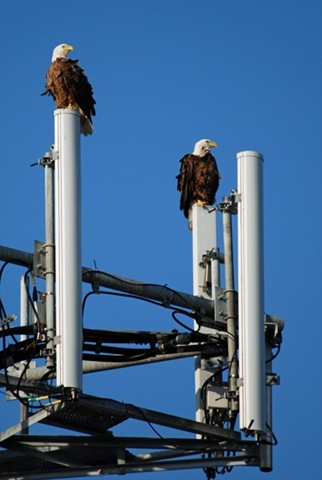 Nature has her rules and I worry bout the parents roosting on the mobil phone tower, I think that may have affected the feotus inside the mother prior to her laying the egg. Shame – Thanks for the report.